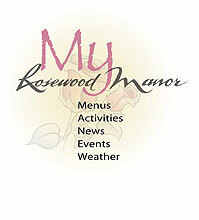 "I would like to extend my thanks for making my mother’s five years at Rosewood so pleasant for her. Mom was very upset when the decision was made for her to move into a retirement home but once settled in, she began to make friends and participate in activities. We hadn’t seen our mother so content in years. Please thank your wonderful staff for all they did for her. For listening, for their care, for their patience and most of all for making mom feel welcome and loved. You are truly all angels of mercy." I come to you in prayer and thank you for all the blessings you bestowed on me over the years and the healings. I pray for each one in my family circle, also for all our friends here at Rosewood. Thanks again for all your blessings Lord. Thank you for your kind remembrance during this sorrowful time. Thank you for all the expressions of sympathy."